28% of the entire world’s websites use WordPress, and that accounts for over 200 million websites as of 2019. WordPress is a highly customizable content management system that you can use for various different websites. 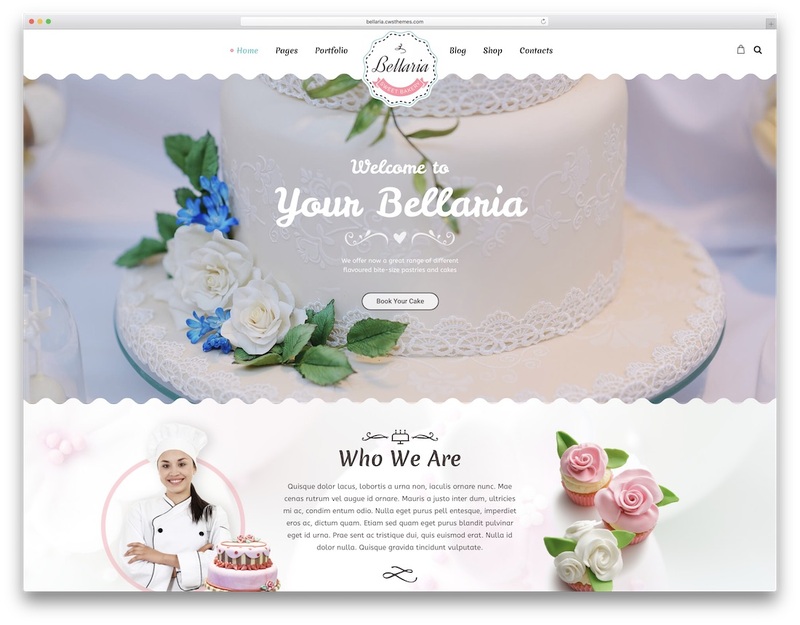 In this article, we have highlighted WordPress themes for bakeries that features custom built menus, contact pages, gallery pages, shop section and much more. 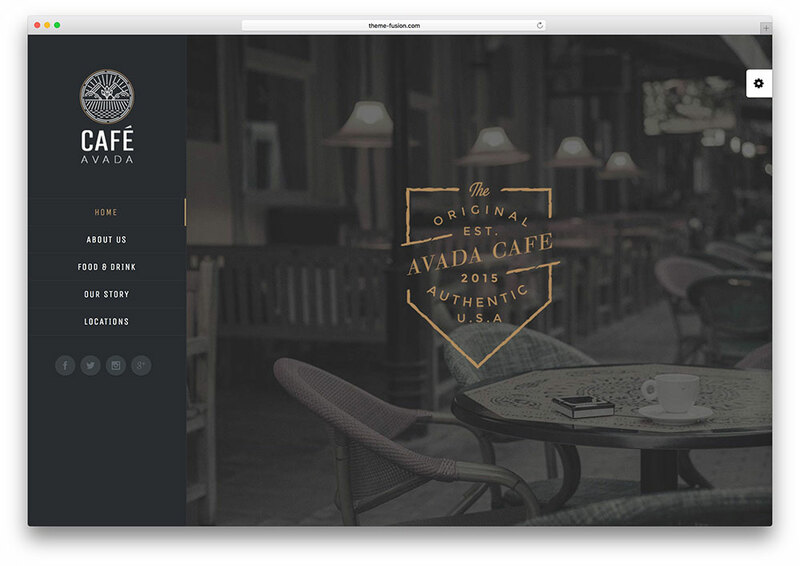 Jevelin is a super versatile WordPress theme for bakeries and other food businesses. With its multiple demos and other predesigned elements and components, you will have a breeze setting up the best possible website for your business. With a well-thought-out web space, you can do a ton for your company and truly take it to an entirely new level. Of course, Jevelin is also mobile- and Retina-ready, cross-browser compatible and is optimized for the best performance. Jevelin creates a visually appealing online presence that are sure to impress your visitors. Realize all your ideas and plans, with the powerful and practical Jevelin. 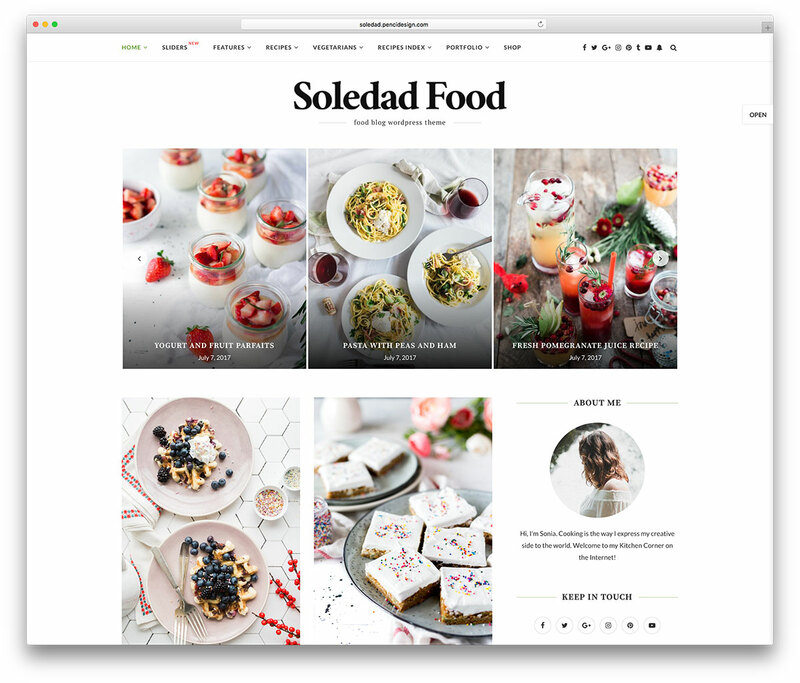 Soledad is an ideal choice for your bakery website. This wonderful product offers many revolutionary features, which aid in simplifying the site creation process. Its WooCommerce plugin integration allows users to craft their own professional eshops. In terms of writing recipes, Soledad has you covered. More than 700 Google and Typekit fonts are available, resulting to a variety of typography variations. Regardless of your chosen settings, the results will look incredible. Soledad’s search engine optimization is sure to get your name out there. This indispensable feature maximizes your chances of online exposure. It should also be mentioned that site owners can implement Google Adsense in multiple locations of the pages. While most themes offer a binary dark/white color scheme choice, Soledad gives you a rainbow. Thanks to the WordPress Live Customizer, users gain access to a limitless array of colors. Changes can be previewed in real time, so feel free to experiment with many variations. 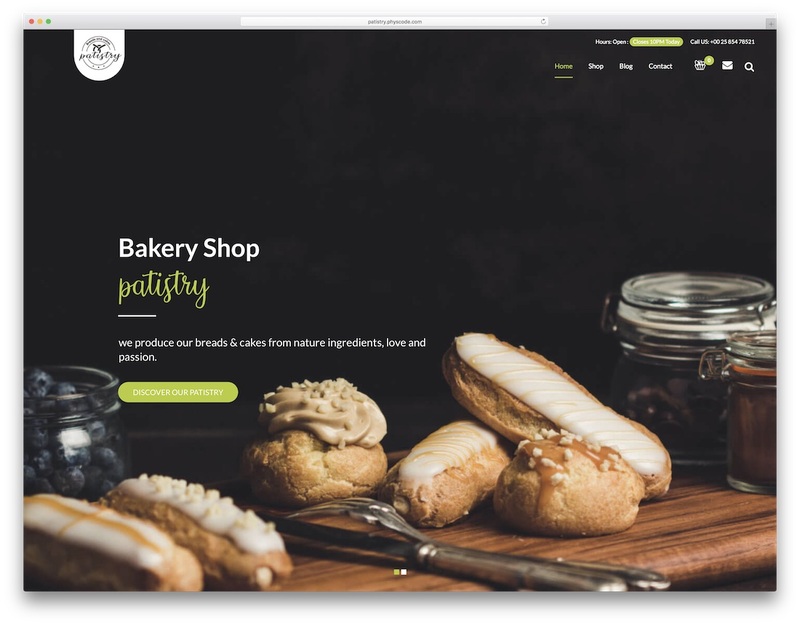 In order to attract more customers and showcase your pastries, you need to create a professional website. That might be a challenging task, but the The Voux can make it easy and accessible. 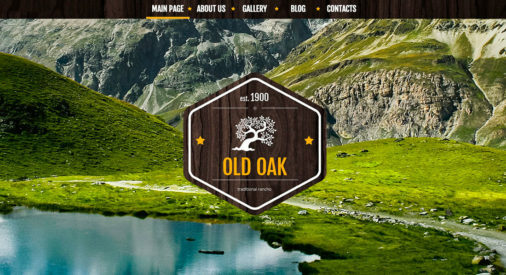 This wonderful WordPress theme has a beautiful design and a layout that can adapt to any screen. Resizing and compatibility will never be an issue, as The Voux works on all operating systems, devices, and web browsers. Of course, The Voux has a stylish gallery option. Using these galleries, site owners can upload pictures of their venues and tasty products. Every picture will look amazing in a full-screen format. The Voux also features a user-friendly header with a powerful mega menu. Categories, sub-categories, and tags can be implemented for you to neatly organize your content. Constructed from the Visual Composer, the installation process will only last for a few minutes – after which, you will gain access to a fully-functional, gorgeous site. For those who wish to sample The Voux, a live preview is available for download. Danny’s Restaurant, as its name puts it, is a special service-oriented tool. It comes with detailed documentation and a fully responsive and easy to setup layout. The creators also featured unlimited colors and multiple pre-built options on the pages’ elements. 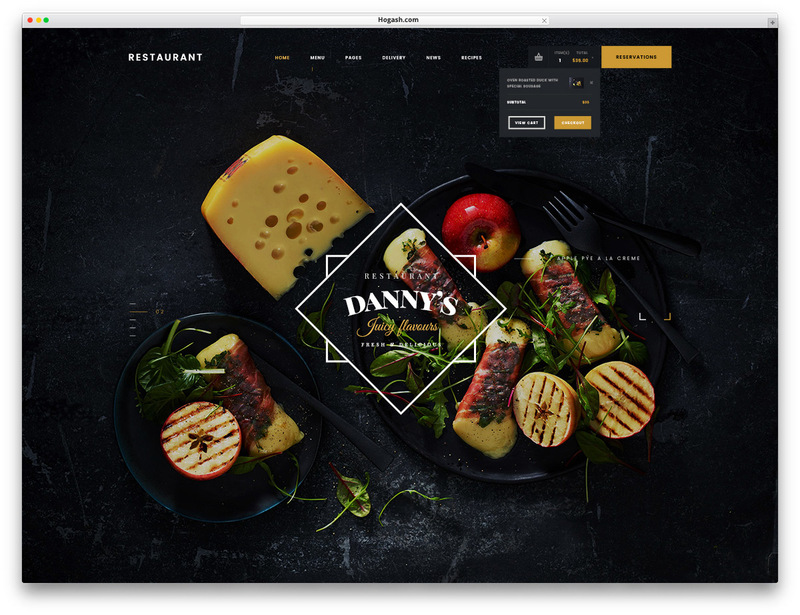 Danny’s restaurant uses the Zion builder, which allows for real time changes and 100+ elements. Its concept is sharp, user-friendly and edgy-looking. It aims to make an impact on your visitors through great visuals. You will also get options, including photo galleries and PSD files. The developers have crafted Danny’s Restaurant with well-thought out additions. Some include newsletters, pricing tables and plugin integrations. You can handle selling aspects like online ordering with the amazing WooCommerce plugin. Meanwhile, manage contact forms, online reservations and such with MailChimp. With social media sharing, making your niche with online sales will be a “piece of cake”! Danny’s Restaurant is also fully translatable for your foreign viewers. Post your latest news, dishes or important events with a dynamic style, as the theme provides lots of documentation. Have a quick look at Danny’s Restaurant’s demo. It is all you will need to fall in love with it! 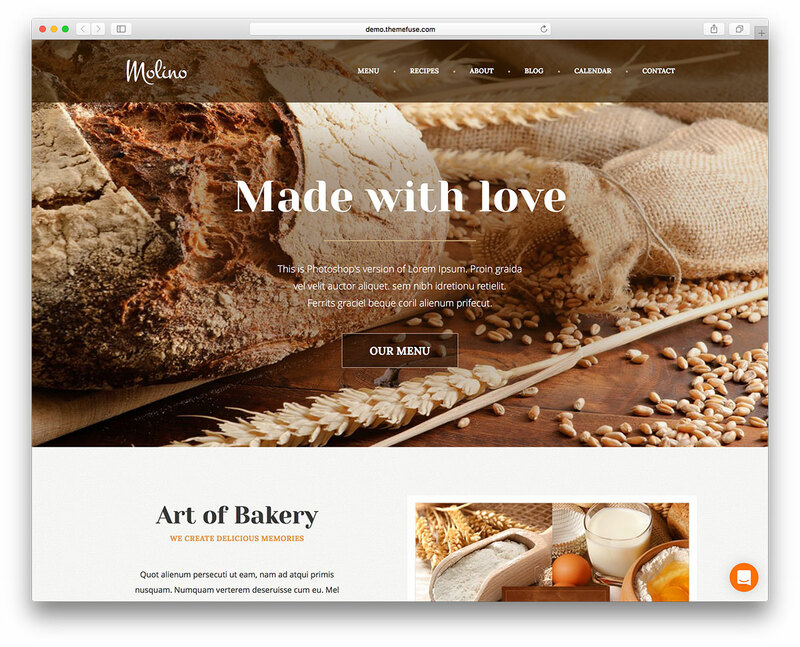 Pastry Love is a WordPress theme exclusively designed for the bakery industry. It is certainly an eye candy first glance, while being quite classy and luxurious. It is fully responsive and easy to customize, and will adapt to any browser and screen size. Pastry Love offers you the most complete options panel for you to play around and get creative. It is also complemented with tons of specialized shortcodes that will help you make intuitive designs. Fonts from Font Awesome, Icons Stroke and Google Fonts are available for an even more personal customization. Pastry Love has unique page transitions that are sure to be eye catchers. You can customize headers, menus, and all your content to suit your final look. Dazzle people with portfolios and its Bold Builder customizations. With the WooCommerce plugin, you get to set up an online shop for additional profit. Don’t feel like you have the creative side in you? Don’t know what you want? Pastry Love comes with a ready-to-use demo to help you out! It also comes with free updates and expert customer support. Come and try this amazing baking tool! Try Pastry Love! Cake Art is a modern and responsive WordPress bakery website theme. It is a beautiful theme that has been put together with loving care and utmost attention to detail. Cake Art empowers webmasters of any skill level or background to effortlessly create the website of their dreams. Whether you are a cook, a chef, a baker, or just a business owner looking to market your products, then Cake Art is the right choice for you. Here you can showcase your craftsmanship through immersive high resolution media presentation. This is bound to have your visitors’ mouths watering and will decidedly increase your business exposure overnight. Complete WooCommerce integration makes it easy for you to open up a new revenue stream for your physical bakery or cake shop. Or, you can outright set up shop online and start baking your way to a sweeter world! 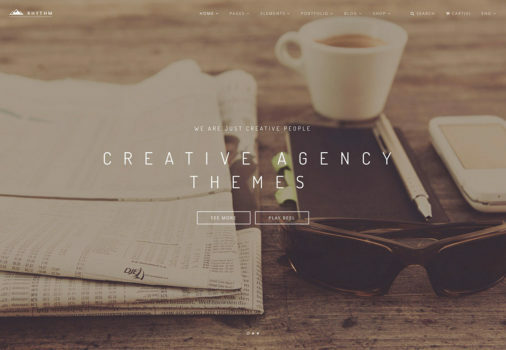 The Core is a multipurpose WordPress theme with a smooth and clear minimalistic look. It comes with numerous demos, as well as a child theme website. It is ideal for people/organizations looking for a quick and easy-to-understand set up. The Core provides multiple pre-built options for several layout and design features, such as headers, colors, footers and layouts. The creators made it SEO-optimized for efficient searches and translations (WPML). The Core also gives you the option of using 30+ shortcodes to simplify the admin panel access. Social media icons are also available for customization in the footers area. For posting, you will find portfolio making features and more than 700 Google Fonts. Despite its already elaborated options, The Core is versatile and has unlimited sidebars. It provides you with customizable footers and backgrounds with several formats to post in. MegaMenu integration is also included, as well as feature animations of all kinds. It even has purchase and donation plug-ins included (WooCommerce and The Give, respectively). The Core also provides amazing customer support for all your inquiries. Take a look and get dazzled! Use The Core now! 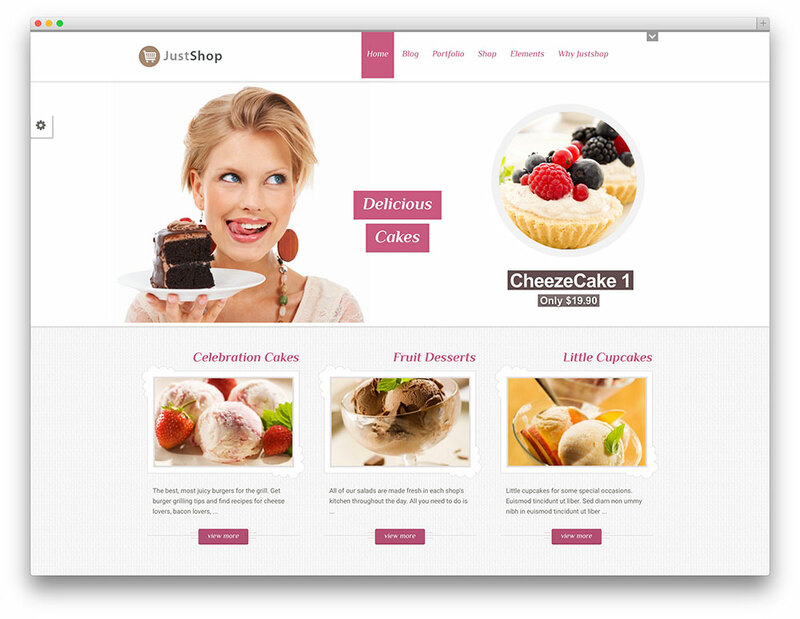 JustShop is a highly responsive and customizable WordPress theme for food- and drink-related websites. You can use it as an eCommerce website thanks to the built-in WooCommerce support. You can also customize JustShop for your different needs with incredible ease. All changes can be done via the simple yet powerful Theme Options. Additionally, there are 5 different homepage and header layouts to choose from. It is multilingual and SEO-friendly to make your business easy to find on most search engines. Take your visitors into an enchanting visual experience with stylish menus and various news and topics to trigger passionate conversations. Newspaper recreates the coffee bar and bakery flavors using special textures, hues and graphic elements. Your visitors will be happy to find this cozy web corner. News Cafe Demo powers all the publishing features of Newspaper. 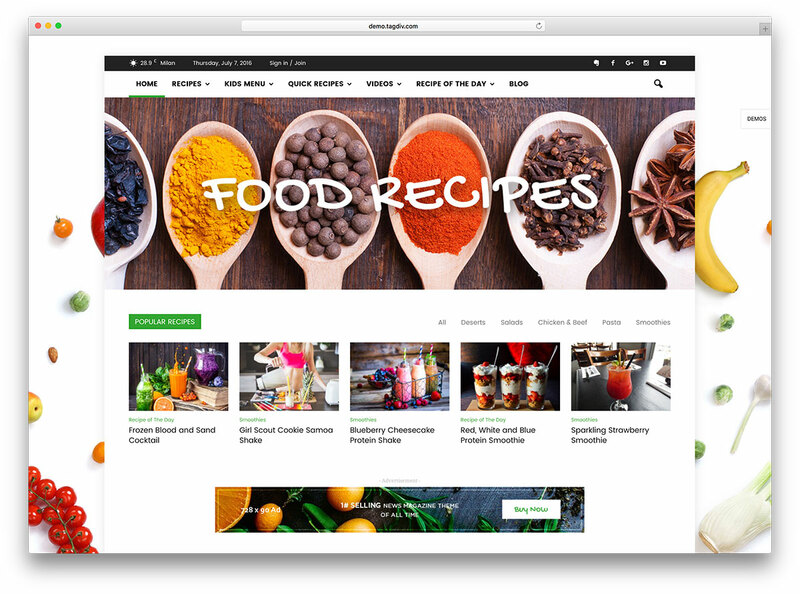 Combine your website – menus, promotions, discounts – with a more personal approach – a blog about your special recipes, events and reviews. 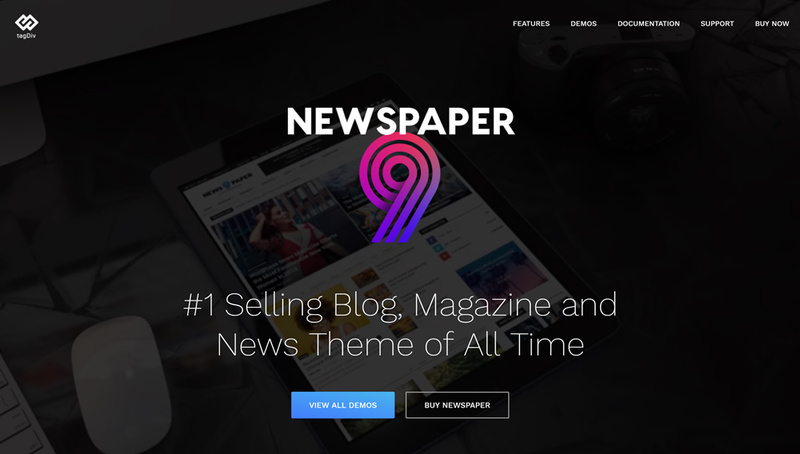 Newspaper is the best-selling WordPress News theme of all time. Created by a power elite author, it is intuitive and responsive. And with the “Mobile theme” custom plugin, your site will look amazing while delivering an outstanding performance on any small screen device. Built with a high quality code and the best SEO practices, Newspaper has an intelligent ad system designed to make your website AdSense ready in a few seconds. This template comes with over 20 unique demos ready to be imported on your website. It also includes a beautiful image slider gallery, video playlists, countless post and page variations, dozens of headers, footers and more. Newspaper challenges your creativity and brings your website to a whole new level! 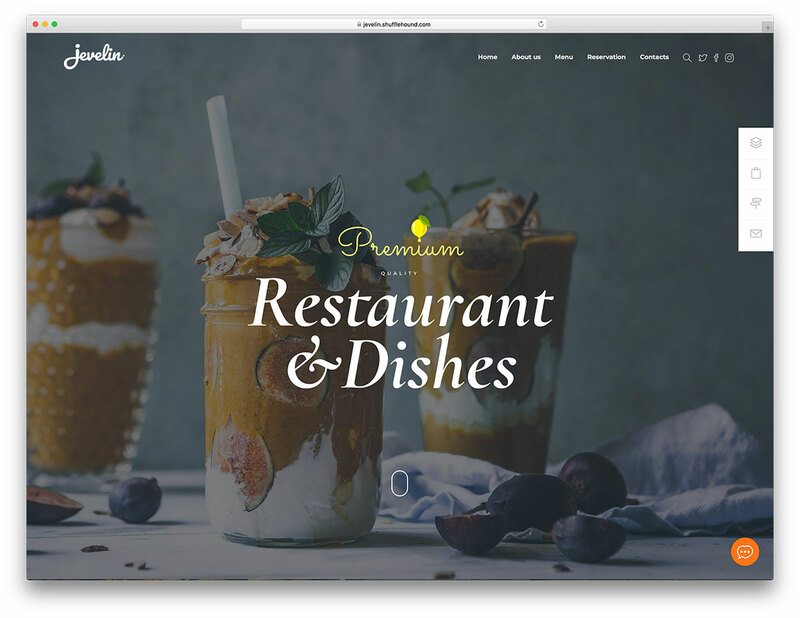 Avada is a clean and attractive WordPress multipurpose theme constructed with a powerful versatility that is especially well suited for the needs of restaurants, cafes, diners, caterers and other food industry related websites. It has a knack for presenting your images and content in a crisp, Retina-ready visual glory. This theme is bursting with tools and features to make your potential customers salivate over your every meal. Build your own online showcase for your menu with gorgeous image gallery layouts, unique transition and animations, elegant pricing guides for all your offered services, site spanning menus for your users’ navigational convenience, gorgeous Parallax effects to make simple scrolling a sublime experience, an inherently responsive design that adapts to every screen and device that renders your website to retain legibility and style. Sort your content in any manner you please, from featured carousels that display your best products and your proudest creations to latest news and blog posts, searchable product galleries and much more. Fulfill your dreams and fill some bellies with Avada! Artemis is one of the bestselling WordPress themes that suits most online and established businesses. It has numerous demos of different topics to satisfy your needs. You can fully document this theme with tutorial videos, etc. Artemis focuses on providing you with amazing image displays for all kinds of products. It also has a Retina-ready image quality with high resolution support. Furthermore, Artemis offers particular add-ons, a gorgeous Lookbook, product quick view, and a shop sidebar. It also offers a very responsive layout that adapts image and menus to all screens and browsers. Artemis bakery, one of it niche demos, has a joyful yet elegant concept that makes photos stand out. It uses Slider Revolution for galleries and WooCommerce for all commercial transactions. Colors and backgrounds are easy to change and make unique in style. You can create a blog to get jumpstart community space conversations. Make amazing and fast-selling systems for catering or pastry gigs with Wish Lists. Artemis is packed in all senses. Aside from all the already mentioned, it uses Visual Composer as its page builder. It is also translatable with po. files. Lastly, you can ask the custom support team to help you with all of your problems. Make your bakery business become the #1 of its type! Try Artemis! Themo is a reliable toolkit for putting together feature-rich modern websites. With Themo, webmasters across the board can articulate great websites. It doesn’t matter what your background or experience level is, Themo has the stuff to make things work. A variety of industries and interests can find in Themo a solid solution for their every need. With tons of page templates and demo websites, Themo makes things simple. The Parallax Composer also makes customization a piece of cake and very intuitive. Moreover, you can achieve aesthetic visual results with Themo in a flash. Impressive portfolio templates and widgets let you showcase your products with style. Furthermore, its premium plugins empower elegant slideshows and carousels. The Revolution Slider, Layer Slider and VC Carousel offer amazing options. Engage your audience in a memorable manner with Themo. Bakeries, dessert stores and similar shops love Themo, as they find in it a robust companion for establishing an online presence. It has tons of custom widgets for introducing products, services and staff. Convenient business page templates make setting up shop quick and simple. Overall, your bakery will be the most unique one on the web with Themo. Try it today! Your tasty, delicious and “eye candy” treats deserve a mouthwatering web design to display them all. Bellaria can help you achieve just that. It is a simple to use tool with a broad selection of features and assets that will get you live on the internet in a snap. Bellaria boasts creativity and uniqueness with its distinctive touch, original shapes and out-of-this-world patterns. In the Bellaria package, there are eight demos to choose from and a broad selection of other pages, elements and styles that you can mix and match with your creative touch. It’s the drag and drop page builder that allows you to go as artistic as you want without the need to touch a single string of code. If you are looking to get your name out there, you might want to create a spectacular web space with Patistry. This WordPress theme for bakeries helps you create an online shop to take your adorable corner store to an entirely new level. You can kick off the whole experience with one of three ready-made home demos and have a better idea of how the outcome can look like right off the bat. Other Patistry features come in the form of Slider Revolution, WPML compatibility, search engine optimization and CSS3 animations. Of course, you get loads more that you can utilize and skyrocket your bakery’s online presence to new epic heights. By the way, mobile-readiness and cross-browser compatibility are also part of this WordPress gem. Patistry makes sure that your website works flawlessly, no matter where they might be viewed. 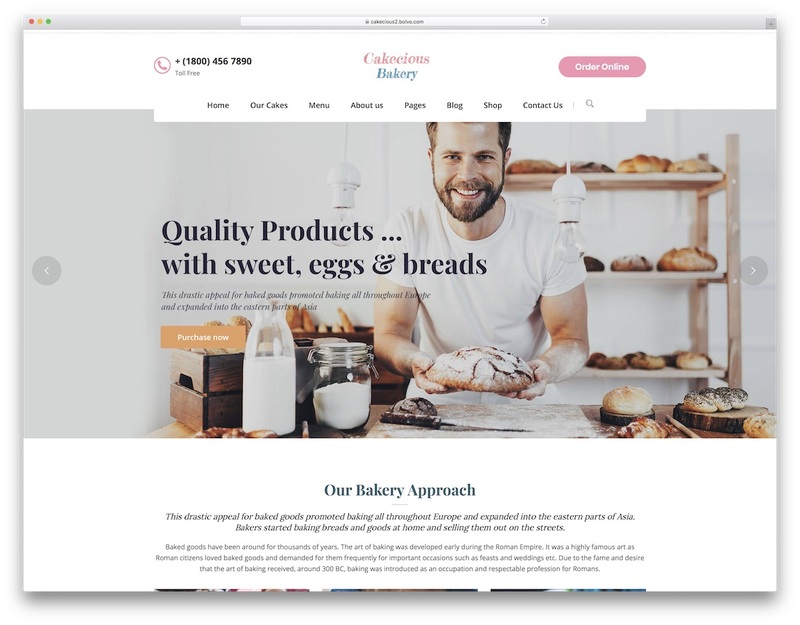 As its name implies, Cakecious is a WordPress theme for bakeries and cake shops with a splendid design. In fact, you are treated to five neat and modern demos, and you can expect new variations to drop with future theme updates. Other templates for About Us, portfolios, blogs, services and Contact Us pages are also ready for you to utilize and experiment with. 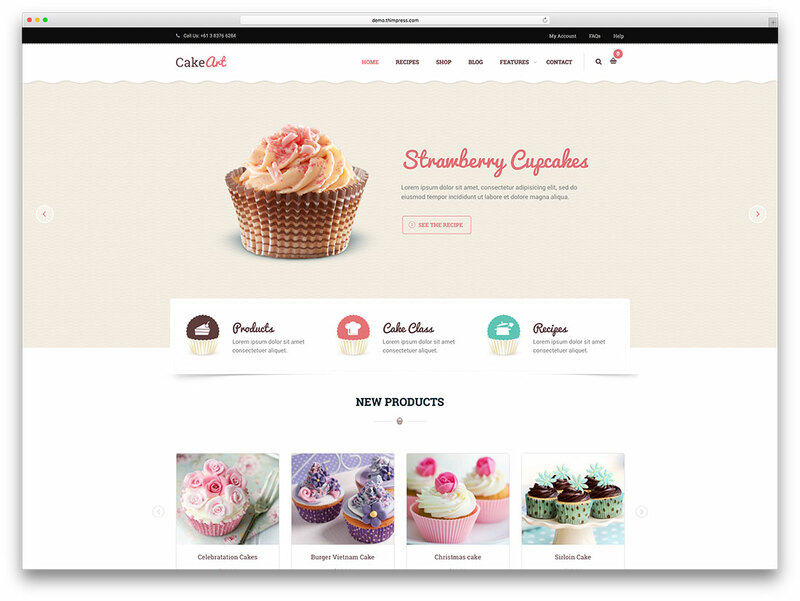 When it comes to other assets, Cakecious has all you need kick-start your bakery page. Different header styles, drag and drop site editor, pixel perfect coding, Contact Form 7 and WPML compatibility are additional functionalities that Cakecious has ready and set for you. What’s cool about Cakecious is the fact that you can test it for thirty days straight and receive a refund within two days in case it does not suit your taste. 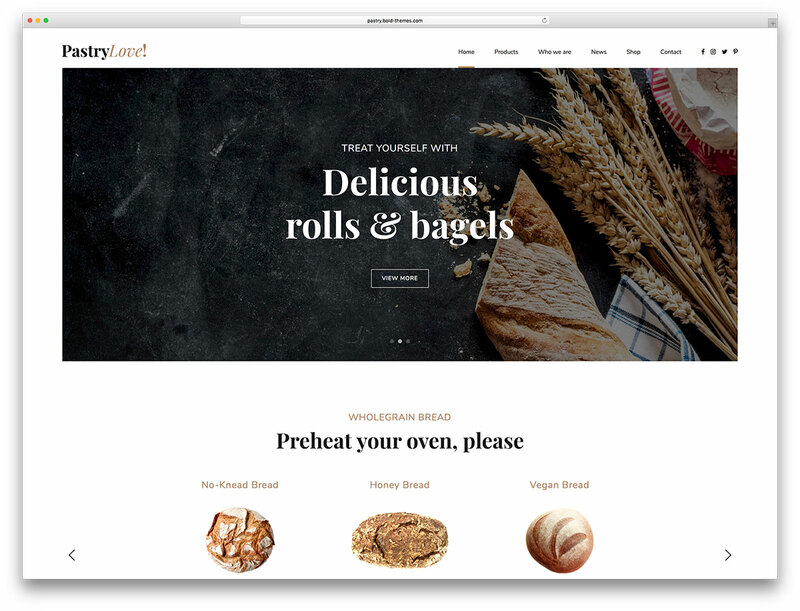 Bakery is a luminously designed WordPress theme built to meet and exceed the expectations of webmasters of any experience level. It is packed full with customized premium plugins such as the Visual Composer page builder, the Revolution Slider, the Master Slider, WooCommerce integration and shop templates, and more. Combined with incredibly handsome gallery and layout customization options, powerful AJAX filtering and sorting technologies and dynamic loading as well as smooth and engaging Parallax visual effects, on top of hundreds of beautiful, Retina-ready Font Icons and shortcodes, tons of helpful preconfigured page templates and more, nobody will ease your workflow like Bakery. Try Bakery today! CuteCake is a Premium one page WordPress theme well known for its uniqueness and versatility. The theme would go well on bakeries, ice cream shops, gift shops, etc. 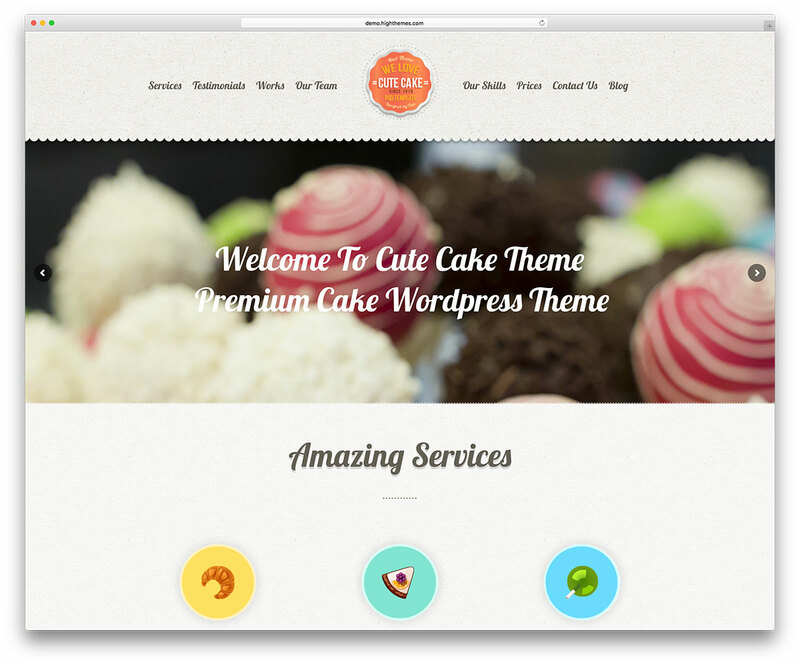 CuteCake comes with great theme options, a powerful visual shortcode manager, and post formats that you can mix and match to achieve the website design that you want. 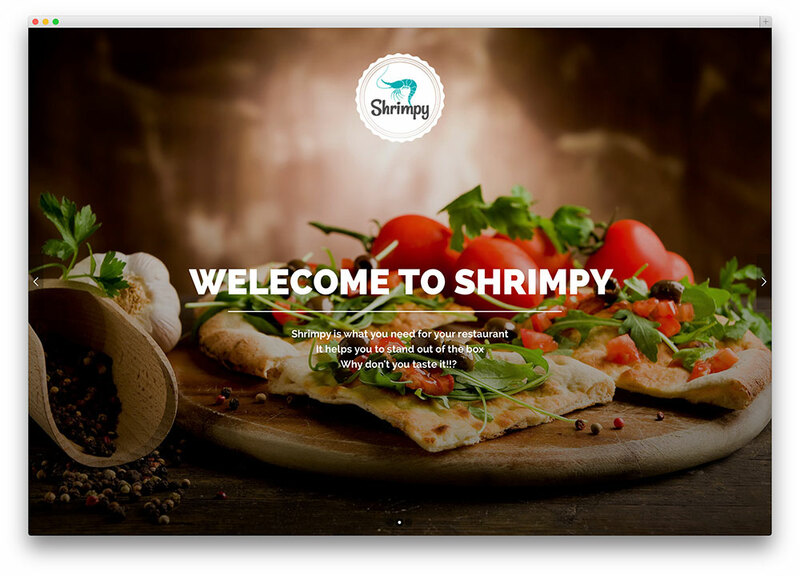 Shrimpy is a well-designed flat and one page WordPress theme perfect ideal for bakery and cake shop websites. It comes with a responsive and mobile-friendly design that makes your website look spectacular across all devices. 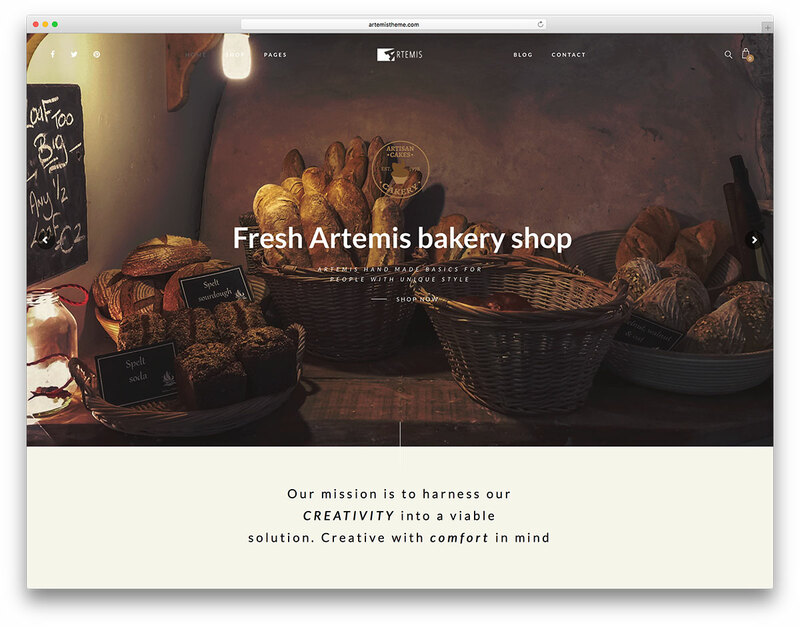 It is also Retina-ready to make your bakery website look astounding and attractive even on high resolution displays. The developers built its framework based on Bootstrap 3 technology, which enables you to customize most of the elements in your website’s main structure without any effort. 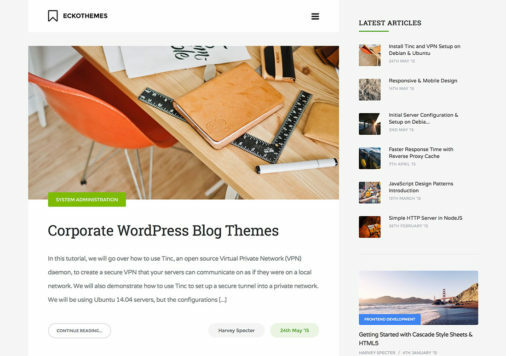 Shrimpy comes with the latest WordPress theme features which make theme customization a “piece of cake”. It also includes functional shortcodes to create several website sections painlessly. Furthermore, this theme comes with ready to install Slider Revolution. It offers predefined color schemes to help you straightforwardly make out the perfect choice of colors for your bakery website. It also includes 600+ Google web fonts and 100 food font icons suitable for your bakeshop or pastry business. Shrimpy offers Food custom post types that provide separate post type for foods where you can write the foods details and use them in different ways. It includes other interesting features such as custom widgets, Contact Form 7, video support and CSS3 animations functionality that allow you to add cool animation effects to your site. You can control and personalize all these powerful theme features through its easy to use admin panel. They designed this modern WordPress theme for speed and usability. A valid HTML5 and CSS3 technology served as the basis of this theme to help you keep pace with the latest web standards and uses Modernizr to detect HTML5 and CSS3 support in the browser. Lastly, it is search engine friendly. 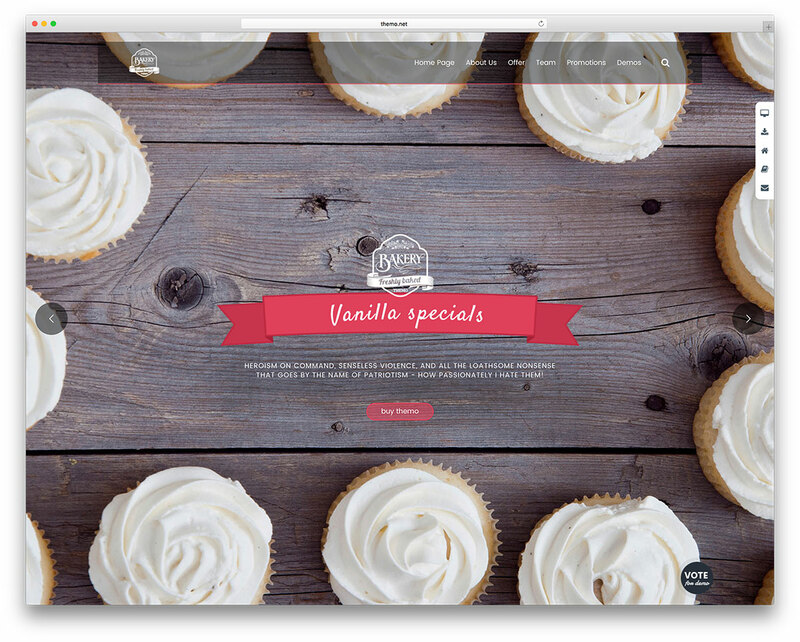 Nice WordPress themes for bakeries. Well. 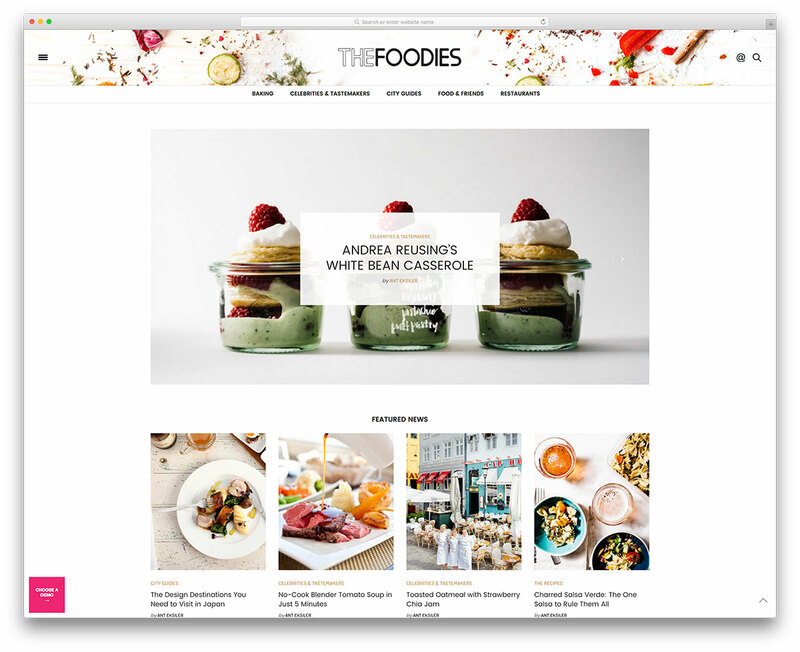 Thanks for the list of foodie wordpress theme. Awesome! Thanks for sharing this WordPress themes for cake bakeries. It will be very useful. Hi Aigar. A brilliant list as always. Any chance you could help me identify any of these slider styles, please? Slider on Lobagola is powered by Swiper slider by iDangero.us. If you are using WordPress then you are out of luck because there is no plugin available based on this slider. However, you can always create your own using this slider or hire someone who could do that for you. The other one for Dine theme demo is called jQuery Roundabout and there are some plugins available for WordPress I couldn’t find any decent one that I could recommend right away but at least there are some. Dine & Drink theme itself uses FlexSlider and there are dozens of plugins available for WordPress. 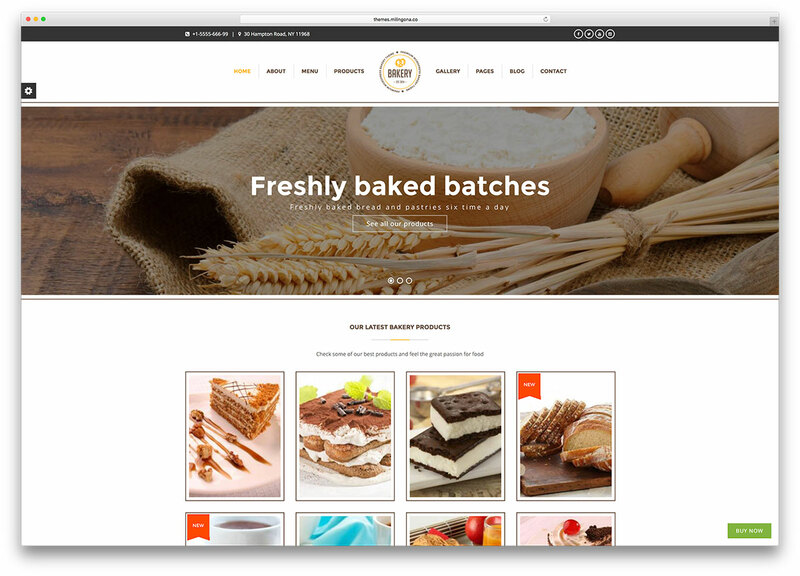 Thanks dear for sharing these awesome WordPress themes for bakeries. The best collection I have found so far! Thank you for your feedback! I really appreciate it. Which theme did you choose and why? Nice work. But a nice and sleek design should have make it to the list. I would be careful about recommending CAFETERIA. We purchased this in November 2016 for a Chocolate retailer. The support for the theme is laughable, no one ever replies. The theme is absolutely NOT responsive on Apple iOS, and images are blurry, no matter what you do. When I contacted the developer he told me, “yeah, we’ll get around to that fix someday.” I’m having to spend my own money on a different theme as my client is beyond frustrated with all the issues, especially those on mobile. Purchasing Cafeteria has created twice the work for me and has cost me twice as much. BUYER BEWARE. I’m sorry to hear about your terrible experience with Cafeteria theme and their support team. To help spread a word about this theme and their support make sure to leave a review with a star rating on their Themeforest page. That way users will know what to expect. We take those ratings into account when choosing themes for our posts and that way it won’t be recommended here ever again. Thank you! Never mind. I already noticed your review on this item on Themeforest. We’ll consider removing it from the list once we do the next update for the article. 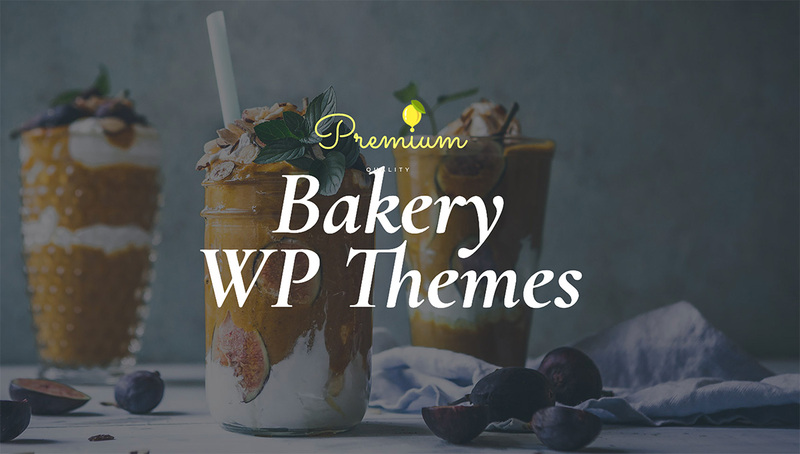 you really shared a very useful themes for bakeries.I use these themes and it looks very amazing. Of course, this Bakery theme has a stylish gallery option. Site owners can upload pictures of their venues and tasty products. Every picture looks amazing, in a full-screen format. Your WordPress theme is outstanding, I think about the new bakery business. That regards I am searching best of best word-press them. Your blog is helping me for taking action. Thanks sir. mind blowing wordpress theme. it’s really amazing and the outstanding work you provided us. Thank you very much for sharing with us bakery theme. I am going to run a new bakery business I think your WordPress theme give me more benefit.